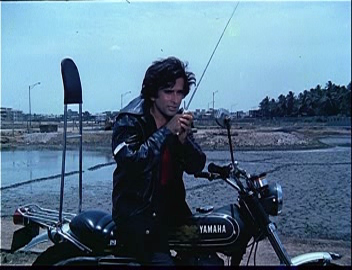 When Katherine at Totally Filmi announced Kapoor Khazana, a month long celebration of the Kapoors, I leapt at the chance to write about some of my favourite Shashi Kapoor films. They’re not all that great but they do have a certain watchability and charm, and lend themselves to excessive screencapping in lieu of analysis. 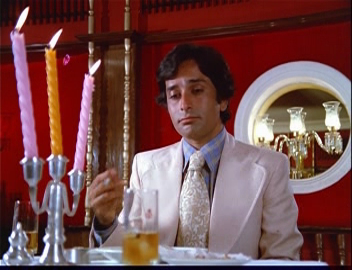 Fakira is not a particularly good film, but it has style, panache and Shashi in a fun jaunt through masala clichés and excellent interior design. Having said it is fun, the first fifteen minutes is a bit bleak. 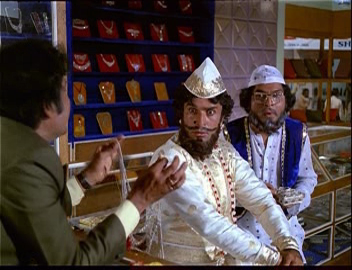 Vijay grows up to become Fakira (Shashi Kapoor!) – Master of disguise, scourge of smugglers and general ladybait. 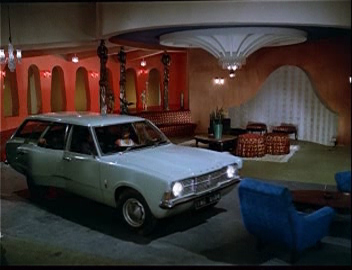 He has an excellent lair, although I have concerns about fumes from cars driving into the lounge. Fakira is a Robin Hood, stealing from the thieves, taking a cut and returning honest folks money. Naturally this makes him of considerable interest to both law enforcement (Iftekhar!) and law breakers (everyone else!). 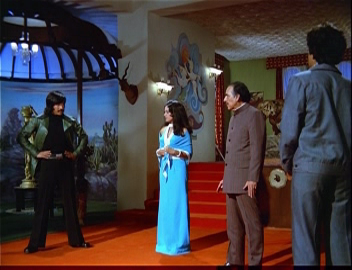 In fact, the bad guys also have a stylish approach to lair design right down to the bad mural and a stuffed tiger. Shashi looks rather fine in this – hair at optimum curl and dishevelment, those eyelashes, tons of fab outfits and a sense of delight that he is getting paid for the dressing up. He does have a dark side though, scarred by his traumatic childhood and possibly aware the subtitle team are up to their hijinks. 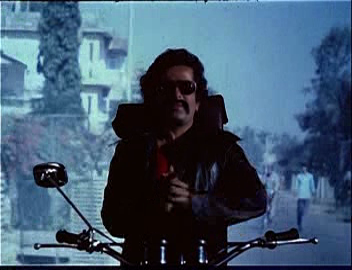 Vijay/Fakira has Popat (Asrani) and Neelam (Aruna Irani) as accomplices, and relies on them as well as his fine array of disguises and stick on moustaches to protect his identity. The supporting cast are all well and truly better than this material but they approach it with a relaxed good humour that makes Fakira so enjoyable to watch. It is the ‘spirit of making do’ in action. 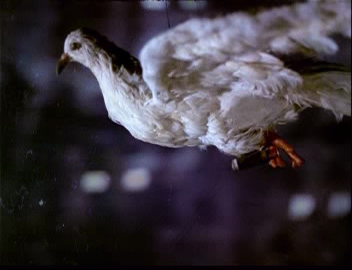 Asrani is particularly effective as the nattily dressed sidekick with a sideline in pigeon training and pertinent quotations. 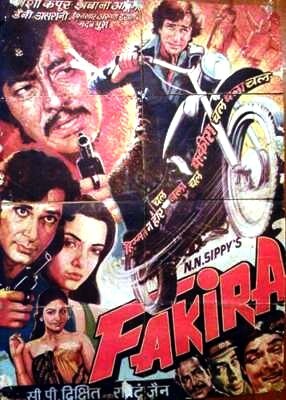 Shabana Azmi is Neeta, daughter of Iftekhar and an undercover policewoman assigned to catch Fakira. She pretends to be an orphan called Geeta and infiltrates Fakira’s lair and heart. 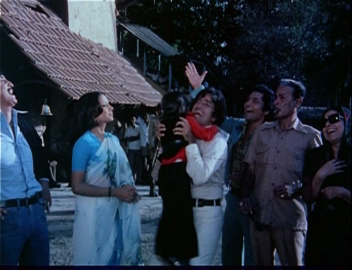 I like Shabana in masala films as she seems as tickled by what is going on as I am. 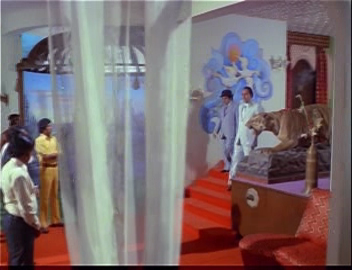 Iftekhar’s house is quite stylish for a policeman’s residence, so Fakira’s lair doesn’t seem to impress Neeta as much as it did me. Shabana gets the memorable bed breaking scene with Shashi after they are secretly married (it was an I love you I hate you I love I hate you you lied I love you forgive me I love you too quickie wedding). 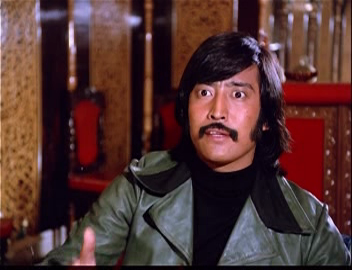 Ajay becomes Toofan, the contract killer and all round menace, played by Danny Denzongpa. 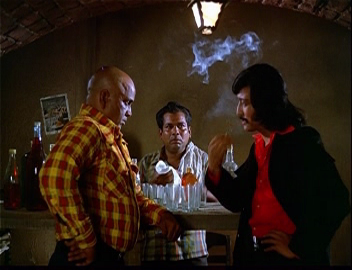 Toofan is hired by Chimanlal (Madan Puri), the local crimelord, to deal with Fakira. Naturally he discovers the truth, but only after a lot of enjoyable sparring and banter with Fakira. Theirs is the adversarial kind of bromance. Neelam is in love with Vijay, and his preference for Neeta/Geeta tips her into a foolish alliance with the bad guys. I suspect there were some underlying wardrobe envy issues as Shabana got the good wife sari collection and Aruna was stuck with a puffy sleeved princess pink frock. 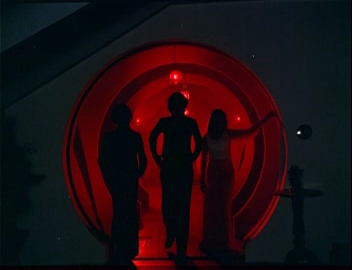 Fakira’s sound activated lights are used to great effect when Neelam decides to go the biffo. 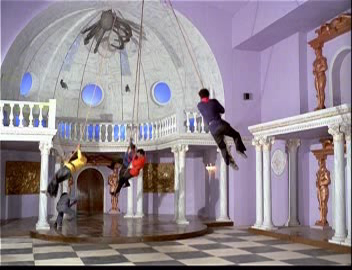 I know I shouldn’t enjoy a catfight this much but come on … It’s Shabana Azmi in a fight scene. You don’t see that every day. So you know, it isn’t a masterpiece but I find it lots of fun. 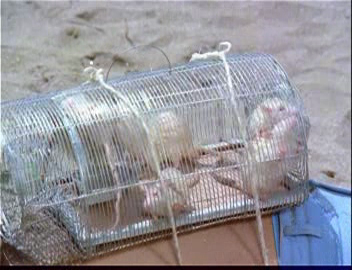 I doubt it would convert anyone to Shashi Kapoor fandom, but I think it’s a good example of vintage masala entertainment. And for those who have wondered what Iftekhar and Danny Denzongpa might look like in a qawwali showdown, Fakira does provide the answer. It’s worth it for the star cast, the dedication of the set design team and C.P Dixit’s commitment to using every trick in the masala book. 3 stars! This entry was posted in Bollywood and tagged Aruna Irani, Asrani, Bollywood, C.P. 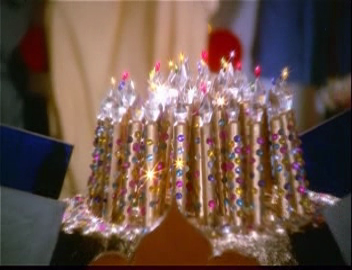 Dixit, Danny Denzongpa, Fakira, Hindi, Iftekhar, Kapoor Khazana, Madan Puri, Ravindra Jain, Shabana Azmi, Shashi Kapoor. Bookmark the permalink. Can you believe I GAVE AWAY my dvd of this? What was I thinking? 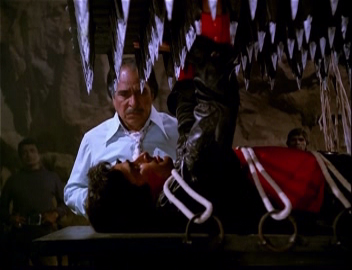 So many A-1 elements: the clap-light fight, the climax in the giant Ravaan, Iftekhar, the lair, Shashi’s shirts…. Sigh. 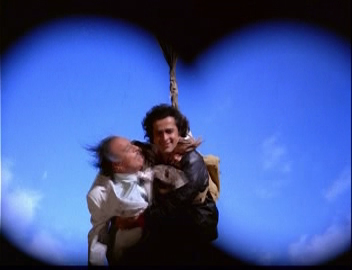 I need to find another film like this – masala Shashi is such a treat. Yes Beth. What were you thinking? I think you need to get another copy of this stat. For your archive of course. Whilst you all lust over Shashi … I shall lust over Danny. Hubba Hubba! Excellent, fun write-up! Shabana in a cat fight? Oh what a treat ! 🙂 I enjoyed your review, thank you! I shan’t be hurrying to buy the DVD though you promise such delightful treats as stuffed-tigers-in-lairs, shabana-in-undercover and bed-breaking-romps…on a rainy day, i will go look for clips..